The wedding of Clare and Ciarán. Just when you think you have figured it out. When you realize the fairy tales of the knight on the white horse is just that, a tale. You see the reality all around you….love is crowned as a mere accessory…..a ring followed by a marriage that looks good on paper. It is just a matter of time before the inevitable split of assets and dividing of time spread out on paper all for the sake of the children. They are not like the fairy tales from our youth? Then there are some that go by the same book of nonsensical rules on how to land the partner you want. Or, by happenstance, chance, are they encouraged to wait, to hold out for the right one. A Love so strong only God can provide. So where did that generation love lessons go?? How did we stray so far from what is real and what is impulse. Who is dressing up the windows of our life these days? Pretty Bridal reality shows on TV for all the world to see, and for what? Ratings? And why are we buying into it? Didn’t anyone find the sentiment of what those tokens represented or were they now looked upon as thorns quickly to be removed. I still have and wear my grandmothers engagement ring, as seen in this picture around my neck. It was a white sapphire given to my wonderful Grandmother with a promise of a diamond. My Grandfather didn’t want to risk her getting away. A promise he kept for he was always a man of his word. That symbol of their love diamond was graced upon her finger but I find the first promise of a man’s love too deep to wait, for an object of consumerism to seal their future, more beautiful than any other piece of jewelry I own. The ring no longer holds a stone instead it hangs from a chain framing a cherub beautifully. This seemingly understated charm necklace holds the love no one could break it went on as the precious circle the ring was meant to symbolize, love unending. So where did that generation’s lessons go?? How did we stray so far from what is real and what is impulse? Who is dressing up the windows of our life these days? And why are we buying into it? If you look very carefully you sometimes get a glimpse of that type of true love today. I am not a die hard cynic or a negative thinker in any way. In fact, just the opposite is true…I am a hopeless romantic. I believe you never ever look for a man…. Rather, he finds you somewhere along the many roads along the way of life. Each and every piece of jewelry I choose and each precious gem I include has to feel just right. Its’ energy absolutely perfect for the brides I have come to adore. She was the first and only one to this day to ask that I incorporate a crucifix into her neck piece. I felt such joy, for I had a container filled with many crosses to choose from. Now I had the long awaited opportunity to open it. I must also add that this particular neck piece was also one of the more challenging of many to make. The weight had to be quite light and I was unable to obtain exact measurements. It is also the first time I admitted openly that I may not be able to accomplish the piece Clare had in mind. Upon her insistence…. I kept designing and redesigning styles….they were not quite what she was looking for. The wedding day was getting closer and the last thing I would ever wish is to cause a bride distress or even inconvenience on her special day. I believe Clare knew the problem was the weight limit. How could I create such a grand piece worthy of this most special union and make it very light. I told her I am a woman of faith, and Clare gave me permission to just forget the limits do my thing. I told her I would say a prayer and let God figure out the measurements and it will be just fine. I’m sure Clare didn’t know how I acquired the same degree of faith she had, nor did I know how she acquired hers. Her personal journey to this moment was one of great challenge and blessings along the way. It all turned out beautifully in the end. The neck piece arrived in time and the fit was precise right down to the centimeter. A necklace made out of faith for a very rare couple and their marriage based entirely on that….faith and faith alone. A more beautiful love story I have yet to hear. For now I do know how and why Clare walks her days in God’s grace and she knows my story as well. It was not until after her special day that we exchanged those details. I don’t think we were suppose to before her wedding day. After all this was a very rare, most grand tale, something barely seen these days. This was meant to be, blessed by God. This was truly a marriage of love and faith……and they will live happily ever after of that I am sure. It is my pleasure to have her permission to share small bits of her heart touching love story. Some day soon it will be told fully in just the right Magazine. 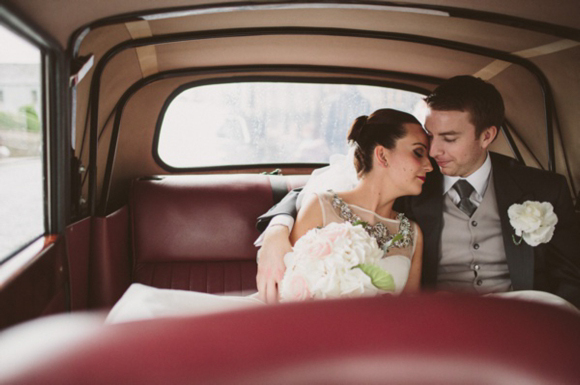 This amazing wedding has been featured on Love My Dress and here is the link to the wedding of Clare and Ciarán…. Beautiful Marelle. I am still making wedding dresses and I will keep you in mind for future partnerships.